Former World Recorder holder and 3 times Olympian David Moorcroft O.B.E has confirmed that he will be starting the 10k race on 15th July. See the Oslympics 10k page for an entry form! Don’t forget to join in the Oswestry Games Parade on the Saturday 30th June. Meet, in club kit, at Cae Glas Park Band Stand at 2.15pm. Click here for the information sheet. Risk Assessment here. Berwyn and Dee Pony Club have announced the schedules for their exciting event at Aston Hall on the 14th July. The Oswestry Games medals have arrived! We will be arranging for the clubs to receive their medals shortly. 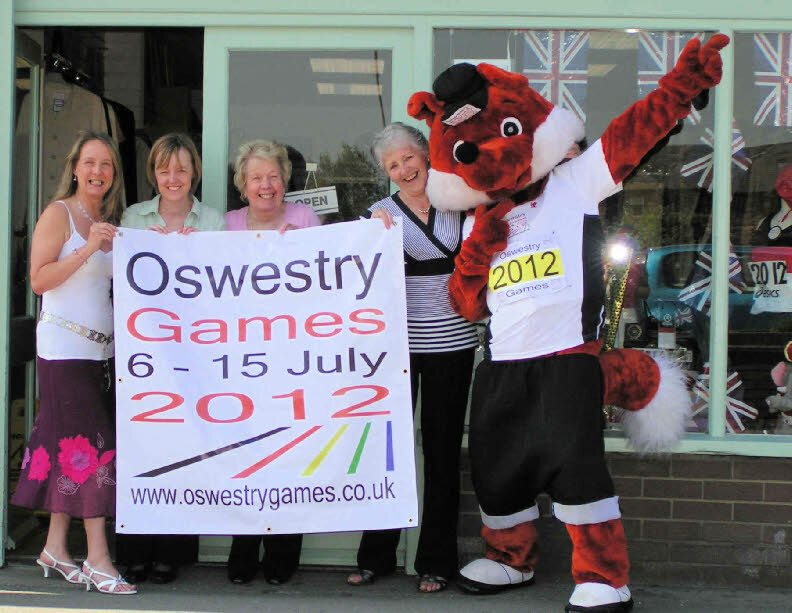 ‘Olly M’ the games mascot will be in Festival Square for the arrival of the Olympic torch in Oswestry. 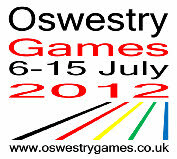 Look out for the Oswestry Games flags in the square. Read local librarian, Heather Rodenhurst’s, fantastic poem about the arrival of the torch! Olly M Pics the Severn Hospice! Staff at the Severn Hospice in Oswestry have designed a beautiful window display depicting the Oswestry Games and the Oswestry Olympians Athletics Club. Pictured below are store manage Debbie Austin (left) with Ruth Jones, Dot West, Jean Murray and Olly M.
Oswestry Mile End Golf Club have added some very exciting events to the Oswestry Games schedule including the ‘Oswestry Open’, an 18-hole golf competition for handicapped players. We now have a Table Tennis Tournament on the closing day, thanks to Jim Reeves of the Oswestry Table Tennis League. Rehearsals for the performances of the Oswestry Games anthem are going very well with the Porthywaen Silver Band and our Community Choir, which now boasts over 40 singers! Chris Powell, from Oswestry Arrows Basketball club is hoping to have 2 teams of Wheelchair basketball players to play a match on the closing day. We now have over 20 nominations for the Oswestry ‘Hall of Fame’ which will be permanently located at the Leisure Centre as a legacy of the Oswestry Games. Walford and North Shropshire College have offered to host the Games launch party, which will include the first performance of the Games anthem. Exciting news! Berwyn and Dee Pony Club have secured Aston Hall in Oswestry with kind permission of the Griffiths family, to hold an equestrian competitiont for the Oslympics . Details of the event to follow but the date is Saturday 14th July 2012. Oswestry Ladies Rounders Team are holding a Mixed FUN Rounders Tournament Saturday 14th July 2012 - 11.30am at Oswestry School Playing Fields. Download an entry form here.